I have Windows 7 64bit, running VS 2010 Professional. I am trying to just get a simple Hello World to load and run. 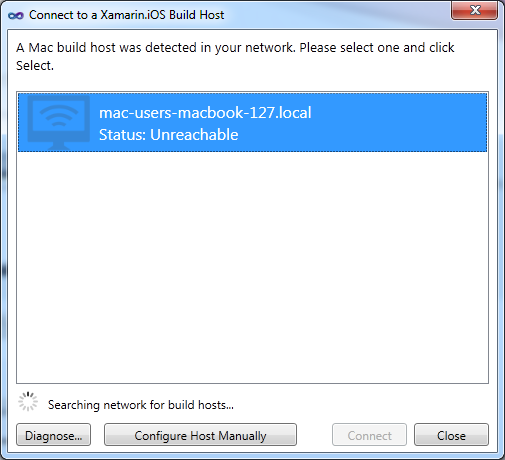 The problem I am having is that the Xamarin.iOS Build Host is not connecting to my host. Status is Unreachable. Attached are two images to show what I am showing right now. How do I create the host? Ive followed everything from http://docs.xamarin.com/guides/ios/getting_started/introduction_to_xamarin_ios_for_visual_studio Ive also uninstalled and reinstalled Xamarin.iOS. Still not working. I thought Xamarin.iOS was supposed to work on Windows now with VS. Am I wrong? Do I have to create a MAC VM? Please help me get this to work. UPDATE: I didn't do anything to fix this. 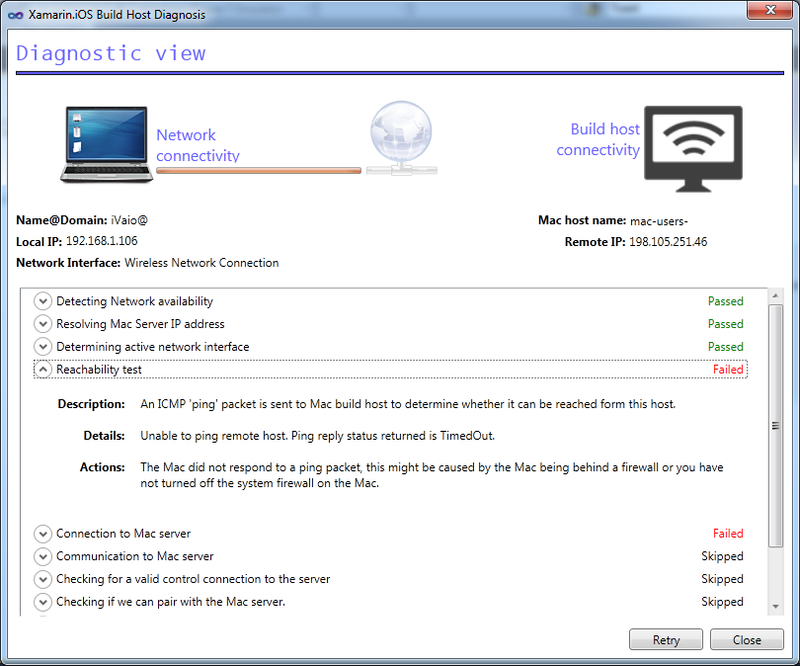 I clicked the Diagnose button again and now getting the attached image: dialogView_Update (Reachability test = failed and Connection to MAC server = failed). If you use a proxy, check if the proxy is disabled for local addresses. I figured it out! I didn't realize I still needed a physical mac in order to run from my pc. I thought the new update (xamarin.ios) enabled me to be able to debug my iphone apps through my pc only. Quite honestly, what's the point of this? What benefit does this do me when i still have to have the physical mac next to me to be able to push the app to the iphone simulator and view it? If I could view the iphone simulator on my windows machine, Ide be happy. Even if I still had to use xcode to do my UI stuff, I'd be very happy if I could use the iphone simulator on the pc. So a question I guess would be, could I view the iphone simulator on my pc? I travel a lot (1/2 the month in hotels) and would like to keep the mac at home and like to only take the pc with me. A lot of people love using Visual Studio, it's a fantastic IDE, additionally Visual Studio has support for Resharper, TFS and other plugins that people use and are familiar with, so this is what Xamarin.iOS for Visual Studio enables. 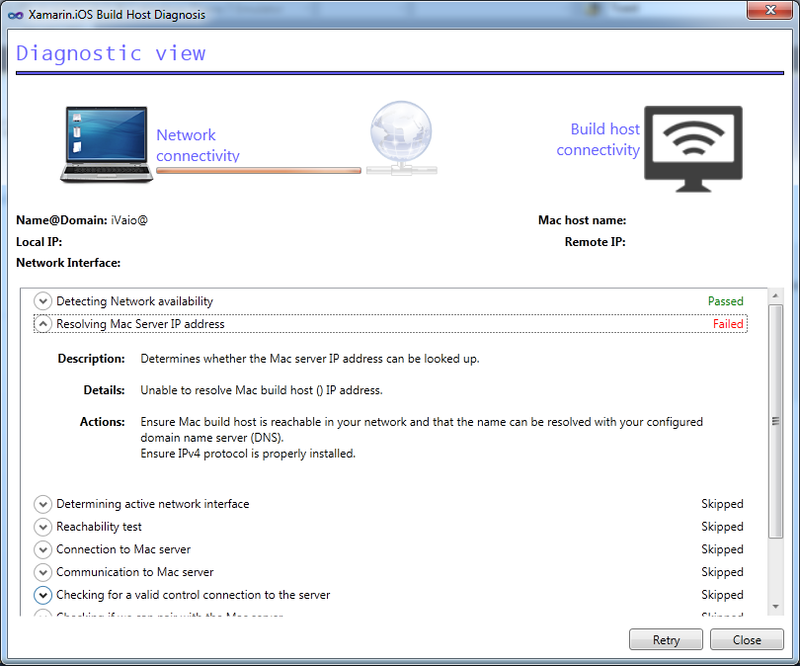 A common set up we see is that users have Bootcamp installed on a Mac laptop and use something like VMWare Fusion or Parallels that will virtualize that bootcamp partition, this enables them to use Visual Studio as a single application that appears to be running on the Mac, so it's a seamless way of integrating the iPhone Simulator and Visual Studio together. We must be have a Mac Computer ? JWei, you have to either have a MAC computer or you can create a VM on your PC and install MAC OS X.